The Broadcast is a transformer coupled, discrete Class-A germanium pre-amplifier based on the classic broadcast consoles of the 1960s. In the low-gain setting, the Broadcast can cover everything from sparkling clean boost through to transparent overdrive, all with a healthy dose of volume available to push your amp. The Broadcast features a specially selected Triad steel-core transformer and a NOS germanium transistor. Advancing the gain on the Broadcast starts to saturate the transformer and the pedal’s discrete circuitry, giving rise to a gentle and dynamic compression coupled with subtle thickening of the midrange. With the gain switch in the high setting and the trim control wound up, the Broadcast starts to deliver heavier distorted sounds with a warm and fuzzy edge to them. The Broadcast covers a wide range of driven and distorted tones whilst remaining dynamic, responding well to pick attack and the subtle nuances of every player. Thanks to Tipunk777 for reverse-engineering his own pedal in the Forum section. one with a 24V charge pump and one without. Added a second layout with charge pump. It's the same as before but on the top of the layout to give more space to the transformer. Great job with the vero, Alex - thx for sharing. The lower gain tones on the video really shine. Built the second layout. Used the wrong transformer. It works and sounds like the video, but my gain and low cut pots aren't doing anything yet. Just finished so haven't looked it over yet. Found a soldering mistake and now low cut works. Do Gain and Low Cut work? Gain still isn't working. It got late so I stopped playing with it. In the schematic in the thread I think the 10 uf attached to gain 1 was 100uf ? Would that change anything? can you try to disconnect Gain 1 and connect it to row 7, right above Sw1? If it works you should reverse Gain 1 & 2 after. Please, let me know if it fixes it. It's all working now. Did the layout change recently? I had been working from a screen cap of it and didn't have the cut on the bottom row. Yes Alex changed the layout as there was an error. also should the oc45 be oc75? and should the bs549c be bc549c? a silicon npn? Yes I think it is bc549c instead, I used a bc549 and an sft 352 pnp germanium transistor. I have a bunch sorted by hfe and I just grabbed one with 70 or 80 hfe. Thanks, I'll keep looking around for this pnp... This pedal sounds great! Did you make the changes to Gain 1? Does the original have the crarge pump? i think there have been 2 different versions, 1 with a charge pump and one without. What would be a good hfe for the germanium transistor? 70-150 range? or under that? 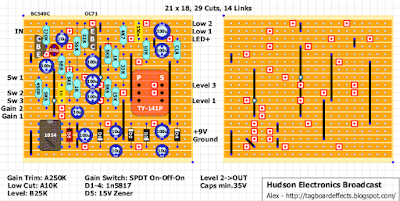 Is the spdt switch on-on-on? Cheers Alex and Tipunk777, I've built the version without the charge pump, and it's working as per expectations, so you can probably tag that layout as verified. Low is pretty subtle, though and I had to make some substitutions of key components because I didn't have exactly the right stuff. So, the non-charge pump layout works with: 470R substituted for the 450R, 22k level pot instead of 25k, a different 1:1 centre-tapped transformer (which I think is a TM018) and a Russian PNP Ge transistor with a measured gain of about 40 that looks like a grey flying saucer. Can anyone share how they mounted their transformer - bend the pins? on its side like in the production photo? Does anyone know if there are more versions of the gain switch? In most videos I have seen online the Pedal has a three position switch. This one seems to be a two position on-on? For the transformer, could one use pins 2 and 5 for ground, instead of 3 and 4 as in the layout? If it's 1:1, then the windings should be the same, right? ...or do you only get half the windings with the center taps? The center tap is a wire connected to the center of the winding. You don't really "get half the winding" from the centertap. It has half of the winding on one side of it, and half of the winding on the other side of it. But to answer your question, if you use the center taps (pins 2 and 5) instead of 3 and 4, it won't work the same as the original. Built the version with the charge pump. Works nicely, except for the fact that it doesn't make an audible difference if the transformer is installed or not. Bridging the across the top row of where the transformer I'd supposed to go (or not making the cut) doesn't change the sound a bit. Checked it back and forth. Installing a different transformer with different impedances cuts a lot of bass, so it's not an error in the build or layout. Just another mojo myth debunked it seems! I would like to be wrong here. Has anyone made different experiences? i own the original 9V Broadcast version in which i later installed an 18V charge pump so it runs on 18V now. upon inspection of your vero layout, one big error that i found is that you have the OC71's emitter and collector reversed. the collector is supposed to connect to a 5K6 resistor to ground and the emitter connects to a 4K7 to the V+. right on. i also drew out my 9V original's vero layout. the thing is, they used vero-board with .133" spacing. BTW, and LT1054 works fine for the 25V charge pump. Can you tell me why there are two different layouts with charge pumps, both with the same components? please read the original text. it explains it. SORRY - I downloaded the images before I read the new bit of info about them. So if the Gain switch is 'on-off-on', it is a 3 position spdt-switch then? Yeah, but you could use a 3 position DPDT too though, and just use one side of it. I have a strange problem with the finished build. I have checked my connections but the gain switch ain't working like it should. I get 'low gain' on middle position, 'medium gain' on the left position and 'High gain' on the right. that sounds correct to me. But in the demos of 3 position switch-model it goes from left to right? Low-mid-high. You should be able to do the same by using an On-On-On DPDT switch. Anyone know of easily accessible, reasonably priced replacements for the OC71? I'm not having any luck finding them. There are some available on ebay, but you can try any PNP Germanium, with hFE somewhere in the Rangemaster/FF zone, 70-120 Cheap alternative would be AC125 which supposed to be replacement. Is it okay to replace one of the 1n5817 with a 1n5818? I just ran out. What value of current limiting resistor are people using on the 24v version of this - and has anyone used an on-off-on or an on-on-on switch for the gain level - I'm wondering which is right? Very nice work, thank you all! Someone can post the voltages on the transistors, mainly on the germanium one? I finally boxed this up yesterday (my 10th keeper). It sounds great! I've wanted this pedal ever since it came out. Thanks to all the posters and commenters on this site!! How would I go about adding a second volume pot so there's one for each gain mode? Would it be possible with a 3PDT? I would also love to know this! Really interested in building the dual footswitch version. i'm trying to make this one but i have one question : what are the small holes I surrounded in green ? They are link points. Just like the points on the ends of the links. You need to connect to all those circles. Hope this helps! Thanks to you Riku ! What are the target voltages for biasing the transistors when running at 24v? I'm guessing the black dot marked on the transformer is the primary side, right? I would also like to know this.. Cheers riku, also any subs for the 15v zener?? Built the version without the charge pump. When I plug the power in and play, it seems to work for a second and then just fades out into nothing. If I hit the strings really hard I can hear a crackle but that's about it. Any ideas? This is my first build that hasn't worked first try! Wow, thanks for this Alex! I've done plenty of PCB builds but this will be y first on Vero. I'm going to do the smaller 9V version. Could somebody let me know what type of capacitors I need for the yellow boxes and red circle? Is there a reason the switch is ON-OFF-ON? Surely an ON-ON would work? Tristan, any luck on your build as of yet? I’m getting ready to source some parts and trying to determine if the charge pump version is worth making over the 9v edition. Especially since there seems to be some whine issues with the 24/25 v version? Thanks, works like a charm andere sounds sweet. Ik built a dual doorswitch version. Just add a second 3PDT switch. Use the first pole as the switch, the second for the led and the third to switch between two level pots. Optionally you van add trim pots for the maximum amount of gain in each channel. The 450R resistor between switch 1 and 3 van be replaced with a trimpot for the lowgain channel. Another trimpot could be added for the highgain channel. He so is the only difference between the dual version and the original that you swap the troggle switch for a footswitch + the internal gaintrimmers per channel and 2 level knobs instead of one? Is there a layout/schematic availabe of the dual version? If not, would any of you be able to make it? Also, do you think it would be possible to replace the universal gain knob for a univeraal level knob and the 2 level knobs for 2 gain knobs instead? Would it sound the same? Like would you only have different controls or would it change the actual sound? And would there need to change anything in the circuit or is it only a matter of wiring in differently? Maybe there would be problems with level differences between the channels, i meand that channel 2 would be much louder than channel 1 when you would switch between them with certain settings. Is ther something as an internal level trimmer instead of an internal gaintrimmer? Would this fix that problem? Just want to build a dual version with a friend of mine so we're just doing some research. 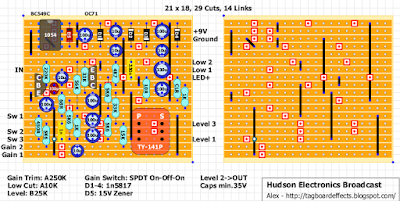 I'm going to attempt to build a dual footswitch version, just going through my parts box now to see what I'm missing. But from the Anon post above, it looks like you'd have levels for high and low gain with the pots. There's a guts shot of a Hudson one on Reverb if you do a googler image search, might help. just built this and used a russian gt404b transistor (hfe around 80) but it sounds really farty and not very musical in all three switch positions. would this be the transistor, or something else in my build? Check pinout, cuts and knife strips. What version did you build? the 2nd layout. i'll have to pop it out and take a closer look. Hmm i had problems eith second layout too. Using a seperate voltage board. Dodgy ic? What ic you using? Using an LT1054 from mouser. I’ll double check voltages/traces/cuts when I’m home next week. stupid me... i was using an npn transistor. will try again with a pnp and report back! I finished the second layout a few days ago. It sounds great, and works just like many of the demos I've seen. However, mine has a steady and rapid ticking that gets louder with more gain. I've put buffers before and after with no change. Any ideas what could be causing this? Update: After reflowing solder, cutting tracks checking with an audio probe I found out I had a faulty potentiometer. now I have sound going through the pedal, but the gain switch and the gain pot are not working. When I turn the gain pot I hear a crackle but the sound is otherwise unchanged. I accidentally touched the gain 1 solder on the enclosure and that caused the gain to show up, but I'm not sure what this means otherwise. any advice would be great. - if you touched the solder on the pot enclosure, you likely shorted it to ground and therefore took it out of the current flow path (?). - check that pot again or replace it. Instead of just reflowing solder, remove it and clean the solder lug surface, do the same for the wire connections on the tag board. Make sure you have good mechanical connections before you solder. - triple check your layout, did you perhaps miss the double link joint (the white dot with blue-ish outline) on the same row as the switch 3 connection? - are your capacitors adequately rated for 24 V? The electrolytics should be rated for > 30 V, 25 v won’t cut it for this layout. Hey Daniel, thank you for the reply. I have 35v caps in the build as per the build sheet. I'll have to check the continuity in in the double link joint to make sure that it is connected properly. I will also look over the layout yet again. I'm not sure if solder quality plays a role in this, but I just bought a new solder iron kit from amazon, and I used the solder that came with the kit. It left many 'grey' solder joints. Did you change the solder you were using mid-build? Probably shouldn't do that, especially if the solder is a different mixture (leaded vs lead-free vs 60/40 vs 65/35, etc.). A grey solder joint is undesirable and may cause issues. I would recommend you clean off any grey solder by heating and using the solder sucker. I too use one of those cheapo blue soldering irons from an Amazon all-in-one kit, with much success too, although the tips are crap and go South quickly. As a note, I made the third layout and added a daughter board for switchable 9/18 V power. I obviously built them separately and this circuit still sounds great at 9 V. If success continues to elude your build, build the third one, get it working then add the daughter board (search under the charge pump section on this website, I used the NE555 layout with the SPDT 9V/18V switch). I decided to build the 9v version last night. I finished it off this morning and... I'm having a similar issue. The gain circuit still isn't working. my transistor voltages are off of what the should be but I'm not sure how to fix that. Hmm.. 0.2 does seem strange/low, but I am no expert at this stuff. The bigger thing to me is that C=B on the OC71... Are you links and cuts correct? I will measure my voltages when I get home tonight and report back to you. - Check your OC71 pinouts. Flip it around if needed. 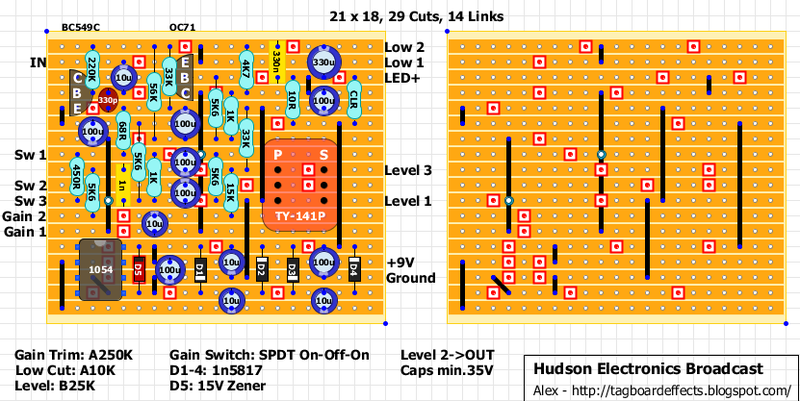 - Print out or save to excel the layout images and zoooom in. For example is that 10R resistor coming off the Voltage rail really 10R for you, etc. Any idea how to use this as a microphone Amplifier? I think there is an issue with symmetric/ non-symmetric. But I have no idea how to build this. Would very much like to build a germanium mic preamp. Your help is very welcome! Thanks. How would I convert this into a dual broadcast? I understand for the dual the gain switch is moved to a stomp, 2 internal trimmers are added to control maximum gain for each side and a pot is added to control the volume of the gain channel. I have no idea where to make these adjustments. Anyone have any clues? Finished build this week. I should have spaced the board out a bit, as plenty of room in a 1590BB. Components ended up a bit cramped. I copied the original's appearance to challenge my level of finish (changed the name). Didn't work 1st time, turned out OC71 wasn't in properly (I used half a 6-pin DIL socket). Noticeable difference for each of the 3 switch positions. I can't hear much difference on low cut after 12 o'clock. Overall really pleased, already on my board.